DURHAM, N.C. — As the North Carolina collegiate football landscape continues to evolve, the Duke Blue Devils have positioned themselves as the top team in the state after nine weeks of the season. 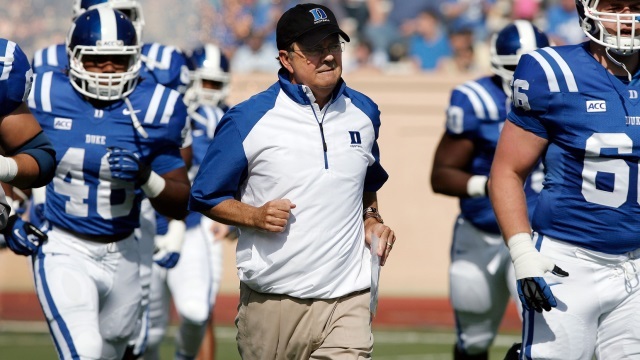 Coach David Cutcliffe, in his sixth year at the helm of the Blue Devils, has quietly built a strong contender for national honors. Duke’s 13-10 win over #16 Virginia Tech was the first road win over a ranked team since 1971. Last season’s Belk Bowl appearance was the first bowl game for Duke since the Hall of Fame Bowl in Tampa in 1995. Basketball is not the only passion on the Durham campus these days. Appalachian State is playing it’s final year as a NCAA Division I (FCS) member before transitioning to the FBS level. Charlotte launched football this season as a FCS member before moving to the FBS level in 2015. UNC Pembroke has only played football for a few years as the have become a NCAA Division II power along with perennial powerhouse Winston-Salem State, who earned a D II national championship game berth last season. 1) Duke: 6-2, NCAA I (FBS) — Win over Virginia Tech in Blacksburg and a convincing 35-7 win over Navy are nice wins. An early 58-55 home loss to Pitt brings the Devils back to earth. 2) East Carolina: 5-2. NCAA I (FBS) — The Pirates crushing North Carolina in Chapel Hill was a plus and an overtime loss at Tulane doesn’t look as bad now as it did then. 3) Wake Forest: 4-4, NCAA I (FBS) — Senior quarterback Tanner Price has the Deacons rolling right now. After a mediocre start including a 21-19 loss to Louisiana-Monroe, the Deacons reeled off a 28-13 thrashing of N.C. State and a 34-10 crush job over a one loss Maryland team, followed by a last second 24-21 loss to No. 7 Miami at Sun Life Stadium. 4) North Carolina State: 3-4, NCAA I (FBS) — First year Wolfpack coach Dave Doeren has battled some key injuries and has had some ups and downs. Key game this week hosting UNC. 5) North Carolina: 2-5, NCAA I (FBS) — Second-year coach Larry Fedora probably didn’t think it would be this tough to produce a consistent winner in Chapel Hill. A last-second loss to undefeated Miami wasn’t near as bad as a home rout by in state rival East Carolina. 6) North Carolina A&T: 4-3, NCAA I (FCS) — The Aggies had a signature win early in Boone against Appalachian State, followed by a convincing win at home over Elon. NCAT lost three straight MEAC games before defeating Florida A&M in overtime last week. Coach Ron Broadway won’t compete for a conference championship this year, but has the Aggies headed in the right direction. 7) UNC Pembroke: 6-1, NCAA II — Currently ranked No. 4 in the national D-II poll, the Braves won six straight to open the season including wins over Winston-Salem State and Charlotte. UNCP hit a speed ump last week and lost to Newberry 24-21. 8)Winston-Salem State: 6-1, NCAA D-II — Last year’s NCAA D-II national runner-up has won six straight after a an opening loss at UNC Pembroke. Ranked in the Top 10 nationally. 9) Appalachian State: 2-6, NCAA I (FCS) — Rocky start for first-year coach Scott Satterfield who took over for legendary coach Jerry Moore. The Mountaineers dropped games to Montana, NC A&T, The Citadel, Samford, Furman and Coastal Carolina, but rebounded win an impressive win against Georgia Southern. ASU and GSU are moving to the Sun Belt next season. To put things in perspective in Boone, Moore only had one losing season in his 24 as the head Mountaineer. 10) North Carolina Central: 4-4, NCAA I (FCS) — Interim head coach Dwayne Foster has the Eagles prepared to fly high again, this time as a member of the MEAC. The Eagles, who were a longtime NCAA D-II powerhouse, are spreading their wings after a pounding of Charlotte on the road. 11) Lenoir-Rhyne: 7-1, NCAA D-II — The Bears have won seven straight including a 35-14 win over Newberry. The only blemish on the record is an opening day loss to Concord (WV). L-RU has been climbing in the D-II polls. 12) Western Carolina: 2-6, NCAA Division I (FCS) — Last week’s OT win over Elon keeps coach Mark Spear’s Catamount’s in the Top 15. WCU had its struggles with Mars Hill in their opener. 13) Elon: 2-7, NCAA I (FCS) — The Phoenix has had some hard times since coach Pete Lembo left for Ball State a few years ago. The Phoenix lost to Western Carolina on the road last week keeps Elon from moving up. 14) Charlotte: 4-4, NCAA Division I (FCS) — With a first-year program, the 49ers have had their ups and downs. UNCC will struggle until the 49ers have upper classmen on their roster. 15) Wingate: 4-3, NCAA Division II — The Bulldogs have put together some solid wins, including a 24-3 victory over St. Augustine’s from the CIAA. Wingate plays in the extremely strong South Atlantic Conference.